"MEKAKUSHI" Vol.12 has been uploaded. Started serially from July 2011, "MEKAKUSHI"(Japanese blinkered outside-in) is a brand new column, describing how Japanese Leather products are perceived by foreigners living in Japan and Japanese overseas. 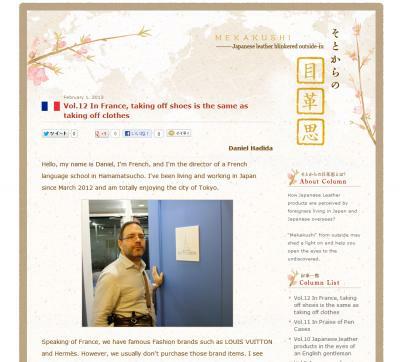 Vol.12 "In France, taking off shoes is the same as taking off clothes" was written by Mr. Daniel Hadida of the French came to Japan in March 2012.